One of the major benefits of placing your bets online rather than at a high street bookmaker is the sheer volume of betting offers that are available to punters. And with more and more bookies, betting sites and sportsbooks springing up on the web every day, there’s now an almost never ending stream of juicy bonuses to get your teeth into (and, fingers crossed, use to make a bit of cash). There are two key types of offer which you need to be aware of when betting online – introductory free bets and bonuses, which can only be claimed once when signing up for the first time to a betting site, and what the bookies call ‘retention offers’ – promotions that are available to all of their customers regardless of how long you’ve had an account with them and how much you bet. We cover both types of offer on this website, but we’ll kick things off with the biggest value sign up promotions. Our top ten bookmakers are listed here followed by enhanced odds new customer deals (when available) below and more detailed descriptions of regular introductory free bets further down. BeGambleAware.org. Minimum deposit £10. Place any sportsbook bet (except Racing) of £20+ at minimum odds of 1.40 (2/5) to receive your free bets and casino bonus. 35x wagering on casino bonus. Free bet will expire 7 days after opt in. £20 Casino bonus will expire after 30 days of opt-in. Deposit (eWallets restrictions apply) and wager £10+ at single or cumulative minimum odds of evens (2.0). £30 free bet awarded within 48 hours then valid for 7 days. Maximum 30 free spins must be used over 5+ game rounds, game restrictions apply, spins expire after 7 days. Open to new UK and Northern Ireland customers, full T&Cs apply. Brexit – Deal Or No Deal, When Will UK Leave? With 45 PGA Tour events almost weekly between October and August if you bet on these events often why not add some extra value? These deals are often only available for a very short time. We only show a small selection of general introductory specials here. For specific matches, sports and tournaments visit our events pages where you can find a wider selection of welcome and all customer promotions. New William Hill online customers only. Min. unit stake of £10/€10 at odds of 1/2 or greater. Only the “win” part from EW bets will count. Free bet terms, payment method & country restrictions apply. Free bets credited as 4 x £10/€10. Free bet stakes are not returned as part of the settlement of successful free bets. All Free Bets must be wagered within 30 days. If you would prefer to see more traditional bookmaker welcome bonuses see our list recommended of free bets below, along with significant terms and how to claim them. Novibet are not exactly brand new, having been established initially in 2010, but they are fairly new to the UK and having been around a while means the brand is completely stocked with features, markets and good existing customer promotions. The site is operated completely in house, meaning they run their own platform, generate their own odds, support and payment systems. This gives the company full control of their product allowing them to make it bespoke to them and their customers. In the modern day it is becoming harder to find new brands that are not a white label or at least partially managed. If you are looking for something new to try therefore Novibet are worth a look over many others. They don't have horse racing, which is the only negative, but hailing from Greece originally means however that in other markets, especially football, you can find tons of events, leagues and cups not so common elsewhere. These are supported by a range of added value regular customer offers. Novibet are also one of only a few new sites in the UK with things like PayPal (and other eWallets), proper stats and blog features and 24/7 customer services. They also are known or Super Odds, where they effectively price some markets 100%, i.e. taking no margin. This is only possible as an independent. For more about Novibet see our new sites page, or to visit or see/claim the welcome offer click below. Below is a list of our recommended free bet and bonus welcome offers. These are not just based on absolute amounts but defined by those that give the best value to our readers. Coral, we believe, are the best all round sports bookmaker for the average punter due their nice balance of short term offers (e.g lots of enhanced odds), long term offers (e.g. Free Bet Club), features (e.g. streaming) and market range and depth. If you don’t have a bookmaker online or you are looking for a new one to try I couldn’t recommend Coral more. This is why we have arranged a bigger welcome free bet deal that you cannot claim direct that gives you more opportunity to try Coral out. Register, deposit and bet £5 or more at 1/2+ (all sports) within two weeks of joining. For this you will be credited with four £5 free bet tokens worth £20 in total. These can be used for any bets you fancy within four days of award and don’t carry minimum or maximum odds. Winnings are returned as cash although the four £5 freebet stakes themselves are of course not given back. Offer for new customers only. Terms & conditions apply. 18+. Begambleaware.org. Ladbrokes is the UK’s oldest bookmaker but they are absolutely at the cutting edge when it comes to online betting and gaming. The bookie quite literally has everything a punter or player would ever need to gamble and for anyone looking for just one site to bet with I doubt you could do better than getting yourself a Ladbrokes account. The welcome promotion is a huge 400% free bet offer. This is a good introductory offer as it suits customers who only want a low stakes bet (£5 at odds of 1/2+ within 2 weeks of sign up), yet want to get a lot of chance to try out the site. Ladbrokes will reward you with no less than four £5 free bets, each valid for 4 days and with no odds restrictions and cash winnings. In effect this is place one £5 bet get four £5 bets free, and won’t be beaten on value. To claim the offer enter code 20FREE on sign up. Deposits made using Skrill, PayPal, Neteller or PaySafe will not be eligible for this promotions. Ladbrokes also provide more daily, weekly and monthly regular customer promos than pretty much any other bookie, meaning you can always get added value for top events and sports. There are few better welcome offer available for UK punters right now in terms of the percentage free than 888 Sport’s bet £10 (1/2+ odds, any markets, within 30 days of registration) and get £30 in free bets, in the form of 3 x £10 tokens. This equates to 300% free and gives you £30 to try the site out from just a £10 wager. The free bets are divided into two £10 unrestricted bets and one £10 mobile free bet. All are completely open and can be used on any sports or markets you wish. The free tokens are valid for one week, have no minimum odds or maximum winnings amount and all winnings from the free bet will be in cash. The free token stakes are of course not returned. To make sure you claim the offer enter code 30f into the promo code box when you make your first deposit. Not just is this one of the most generous welcome promotions available from a UK betting site it is also one of the most useful. Here you get to try out multiple bet types, markets and products giving you the best chance of finding out if this is the bookie for you. On top of all of this 888 have some of the best promotions for regular customers across all sports. For more details read our 888 review. William Hill are often seen as old fashioned because they have been around on the high street for most of people’s lives. The massive British bookmaker however has one of the biggest, best and feature packed online betting sites in the whole world. For anyone looking for a bookie that does everything with fair odds and good offers you can’t go wrong with William Hill. For trying out the site Hill’s will reward your first £10+ bet (on any 1/2+ market) with £30 in free bets, awarded as three separate unrestricted £10 tokens. To qualify sign up using promotional code C30 and deposit with any methods other than Skrill, Neteller or PaySafe to claim your free bets. The freebies themselves don’t expire for one month, winnings are cash and uncapped, stake is not returned. William Hill cover every sports and event in incredible depth but for football and horse racing there are very few who can match them for value, deals, streaming and coverage. A must have bookie for anyone. BetVictor are a very professional online bookmaker and they are very proud of the customer experience they provide. In fact, they are so confident in their product that they give new customers not only a massively generous 600% free introductory deal, they have designed this in a way that allows you to try out multiple markets and sections. For just a £5 deposit and bet (evens+, any markets, within 7 days of registration) you will get two £10 sports free bets, the first is completely open to be used on what you like as long as the odds are evens or more, the second £10 free is for use on any 3-selection+ accumulator bet. All are valid for one week and have no further restrictions. On top of this you will also get a £10 casino bonus which also expires after 7 days and has a 40x rollover. See BetVictor for game contributions to the wagering requirement. If the sign up promo isn’t enough reason to try out BetVictor they also offer insurance on 5+ footy accas, some of the fairest horse racing terms as well as personalised free bet offers weekly suited to the sports and events that you actually want to bet on. Bet365 claim to be the world’s favourite betting site and from our experience they are bang on correct. No other betting site sets the bar as high as Bet365 when it comes to rewarding customer loyalty with great odds, offers and pioneering features. It’s not just about introductory deals with Bet365 though. Regular users also get huge benefits from long term promotions in the industry (we believe) and offers that prevent you getting stung when things go wrong. You can also access to what we think are the best features in the industry such as full/partial/auto cash out, exceptional live betting, massive amounts of live streamed events, live bet editing facilities, and more. Unibet are huge and can compete with the UK highstreet big boys when it comes to markets and feature. For example, Unibet stream around 60,000 live events each each, have exceptional existing customer promotions along with honest and good value day to day prices. We like Unibet so much we’ve arranged a special welcome offer for our customers that cannot be found directly with them. Register, opt in and deposit £5+. Place a first bet of £20+ (any market except racing) and whether it wins or loses you will get two free tokens worth £10. One token is for use on any pre-event market and the other to be used in-play. To qualify your wager must be placed on something with odds of 2/5 or greater and the free bets must also be used on a market with a price of 2/5+. The free token will be valid for 7 days and is issues on settlement of the first bet. It is unrestricted so can be used on any markets or sports you like. On top of this also get a £20 casino bonus which carries a 35x wagering requirement. You an use this in the casino, live casino or on slots and games, table games and poker however will only count 10% towards any rollover. Sportsbook welcome deals don’t come more generous than the one currently available from Betfred. For a £10 deposit and bet (at even odds or more, any sports/markets) you will get a £30 free bet for sports and 30 free spins for the casino. This gives you as the customer the rare opportunely to try out both major sections of the site for a very low stake of just £10. The qualifying bet must settle within 60 days of signing up for you to get your free funds. The £30 sports token and 30 spins will then be credited within 2 days. You have 3 days to accept the spins and then both the spins and free sports token remain valid for one week. The token can be bet on anything you wish with cash winnings, the spins are properly free meaning once all sued winnings are given in cash. ComeOn have a very rare type of introductory offer that gives customers not just a free bet for the sportsbook but also a bonus for the casino along with 20 (no deposit needed) casino spins – meaning you can try out the whole site for a very low deposit amount. 20 casino spins are given on registration and are valid for NetEnt’s Starburst. Spins must be used within 7 days, have a 30x play through on winnings and a maximum payout of £100. Deposit £10 or more and you will get a matched bonus for the casino up to £25 (valid 30 days). This comes with a 35x wagering requirement and can be used for most games on site. Once you’ve placed a £10+ bet on any market with a price of 4/5+ you will also get a £10 unrestricted sports free bet valid for 14 days. ComeOn don’t have the biggest sign up deal around but what they do have is one of the most open and honest betting sites you can find in the UK market. Everything about ComeOn, from their offers to their terms, is about clarity and openness with customers. The loyalty points scheme is one of the best in the business, is available for sports, and gives genuinely valuable prizes and bonuses that reward regular punters. Betway have moved very rapidly from being a new betting site to an established UK online bookmaker. In just over ten years the company have built a solid reputation as good place to bet with strong market range and depth, top offers (e.g. free bet club) and fantastic loyalty programme (Plus points). You will also notice Betway are big sponsors of sports these days (e.g. West Ham, Racing, Darts, Snooker, etc), so expect some fantastic deals with these guys for top events. As an incentive for you to try Betway the bookie are offering to match your first deposit from a minimum of £10 up to £30 with a free bet. Opt in by ticking the box to say you want the offer when you sign up. The free bet will be awarded as soon as you have bet the deposit once at minimum odds of 3/4+ (or 2/5+ each pick in an accumulator). The free bet doesn’t expire for one week and can be used as you wish with cash winnings (stake not returned). In addition to great markets and promotions Betway also have one of the best looking and easiest to use websites and mobile app in the whole industry. An absolute pleasure to use. 10Bet for a long time were just one of the pack but in recent years they have come out all guns blazing to create a sportsbook that can compete with the biggest players like Bet365 and William Hill. 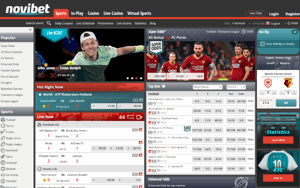 The bookie offers astonishing market range and depth, especially for football, along with all the top features you come to expect form the best sites; streaming, partial cash out, etc. I really like 10Bet, they are a bookmaker for proper punters who like to place lots of different types of bets and still get good value. On your first deposit with 10Bet accept the promotion when prompted and you will receive a 100% matched bonus on deposits from £15 up to £100 if you sign up. This will give you a bonus between £15 to £100, flexible to suit all types of punter. The bonus comes with an 6x the deposit and bonus turnover in 30 days, more terms above and in our full review. Deposit using any method other than Skrill or Neteller. On top of this get a massive range of good value existing customer offers for pretty much every sporting event going. They also have some very novel and fun features such as pulse bet. This is a proper bettors bookie. Top Tip: Make sure you check out our site before you place a bet to make sure you are getting the best deal available – bookies often run special one-off promotions for big events and if you’re not in the know, you might miss out. To help you find the right offer we have compiled lists for various sports including football, horse racing, rugby, tennis, golf and more. We also provide guides and previews of the biggest sporting events, such as Wimbledon, Cheltenham, Royal Ascot and many many more. We even cover UK general elections and non-sporting events. Our guides will not only help you find the best bet and offer but also give you the low down on the key facts and features about the events. At LatestBettingOffers.co.uk we bring you up to date details of the promotions that are currently being offered by top UK online bookmakers and betting sites. And we are not just about the big sign up bonuses either, as we also list the latest offers for existing customers as well. With the help of our site you can find the right bookmaker, the right bet and turn the odds in your favour. The online bookmaking industry is one of the most generous around in terms of its deals for new and existing customers. In recent years the number of markets and depth of market offered by bookies has exploded with promotions available for big events in almost every sport. Keeping track of all these offers is almost a full time job and unless you are a professional gambler you won’t have the time to trawl all the bookies to find the best deals – especially as many of them are released late and expire quickly. Don’t get bet regret by missing out on the top offers and features. At LBO we do the hard work for you and list all of the best offers in one place for your convenience. All betting sites and bookmakers featured on the site have been fully vetted by our team and are also licensed in the United Kingdom and regulated by the UK Gambling Commission. If you do not have an existing account with the bookmakers listed above we strongly recommend you sign up to ensure you don’t miss out on any lucrative opportunities as many betting sites email exclusive offers to their customers. Remember there is no reason why you cannot have accounts with several online bookmakers. Having a wide portfolio of online bookmakers allows you to take advantage of the top odds, offers, deals and promotions on an event by event basis. To claim an introductory offer at a betting site you must be a new customer. Don’t worry if you are not there are plenty of sign up offers available for you to try out and even if you have tried them all we cover a full range of existing customer offers to make sure you are getting the best out of your betting. Deposit Bonuses – These are the best types of sign up offer, the bookie is matching your deposit with promo cash. The main advantage of this is you can divide your promo cash into several bets rather than having to wager a set free bet amount. Deposit bonus cash can often be withdrawn once the cash has been rolled over a certain number of times. Qualifying bets usually have minimum odds and you may be required to complete your bets within a time period. Free Bets – These are usually matched to your first bet or deposit. You will be required to wager an initial bet from your deposit with minimum odds, you will then be awarded a free bet irrespective of the outcome of your first bet. Free Bet stakes are usually not returned although this is not always the case. Risk Free Bets – This is where your first bet is risk free up to a set value. For example a £25 risk free bet means if the first bet you place up to that value loses then you will be given a free bet to the same value giving you a second chance to win. Risk free bets rarely have minimum odds and free bet stakes are generally not returned. Enhanced Odds – New customer enhanced odds offers tend to be highly specific to an event. Time is limited to take advantage of these but they tend to be more valuable than the main sign up offer so if you were going to bet on that event anyway it is usually worth it. You can find a list of these kinds of promotions at the top of this page above the typical welcome deals. As an example you may get enhanced odds of 12/1 for Andy Murray to win Wimbledon. These odds are crazy and this means you can win a lot in free cash by signing up. Often you’ll also receive a free bet if your bet loses making these types of bonus win-win. These bets will have a maximum stake but if you do win you can keep your winnings as cash! When a bookie gives you a bonus, free bet or enhanced odds there are usually conditions attached. In this next section we’ll cover the most common terms that you’ll come across. Minimum Odds – Most free bets and deposit bonuses will have minimum odds requirements attached to them. These are the minimum odds that your qualifying bet must be in order to activate the free bet or promo cash. These offers usually apply to singles and accumulators as long as minimum odds are met but it is worth checking the bet types that apply in advance to be sure you are meeting the requirements. Risk free bets often don’t have minimum odds as you will be awarded the free bet only if your first bet loses. Rollover Requirements – When promo cash is awarded there is usually a rollover requirement (also sometimes called wagering, turnover or play through requirement) before you will be allowed to withdraw the bonus as cash. The rollover generally applies as a multiple of the initial deposit and/or bonus cash. As an example if you deposited £50 for a £50 matched deposit bonus with 5x bonus + deposit rollover you will need to place £500 of qualifying bets in order to be able to withdraw the bonus. Rollover requirements can have a time limit, although rarely less than 30 days. Check in advance. There is no sentiment when it comes to placing the best bets and so good retention offers and loyalty bonuses are available to keep you betting. If you sign up to a few bookies you can put yourself in a great position to take advantage of promotions when they come up putting the odds in your favour. Some offers are long standing and have been around for years whilst others are a flash in the pan and specific to individual events. At LatestBettingOffers.co.uk we aim to bring you every major offer from our list of trusted UK online bookmakers. If you bet regularly it’s definitely worth signing up to several bookies, taking advantage of the welcome deals and then planning your bets appropriately. By checking our site regularly you can make sure you are maximising your profits by utilising the best offer available. You can find details of the actual offers on the relevant sport or event page, but here we show you some of the common loyalty and existing customer offer types. Money Back Specials – This is the most common type of offer. These give your money back, usually as a free bet, if your bet loses but meets some other conditions. A common example is money back if a football game finishes in a draw (known as Bore Draw) or if your horse finishes second by less than a head. Loyalty Points and Prizes – Not as common as they used to be but you can still find loyalty bonuses with some bookies. These can be structured points systems like those offered by ComeOn, where each bet gives you a certain number of points that can be traded for cash, free bets or prizes. More popular are prize draws and entry for customers who reach certain limits or interact through social media. Many bookies will often throw you a free bet or really special offer from time to time, especially if you have been inactive for a little while. Coral are great for this type of thing so if you don’t have an account with either of them we recommend getting one now. Additional Products – Bookies are always coming up with clever new products and services to make betting easier and better for the punter. To get you to try these new features out it is common for a bookmaker to offer you a free bet or other incentive to use them. For example when you sign up with a bookie it is normal to receive an additional offer to use the mobile app. Other customary offers include those that promote use of the live betting services, especially those that combine pre-event with in play betting. Reload Bonuses – These bonuses keep you betting beyond your first deposit or bet bonus. By topping up your account or placing more bets at certain times some bookies will give you percentage bonuses as a free bet or promo cash. Enhanced Payout Offers – Headline grabbing offers are really popular around big sporting events. If you’re thinking of placing a big outright bet on a major event like the FA Cup final for example then have a scan of the offers from all the betting sites. Bookmakers will run some enhanced odds offers at cost or even a loss to get your custom so don’t miss out. An example of an enhanced odds offer might be something like a fixed odds treble, Liverpool, Manchester United and Arsenal all to win 6/1, the real odds may be closer to 3 or 4/1. Free Bets – In addition to the usual introductory free bets some operators also provide regular free bets when betting on certain events. These come in all sorts of formats and some bookies, like Coral, are better than others at pushing these to their customers. For example you may get an offer like ‘Bet £20 on any sports market and get a £10 free bet the Champions League Final’. Lots of other types or promotion are available and the bookies are very good with coming up with new and inventive ideas. We make every effort to keep ahead of the curve on all major bookie deals so check back with LBO regularly to ensure stay on top of what’s available.